A bath and body must have: Solid Lotion Bar! into a rich moisturizing lotion. needed. Super long shelf life. Convenient to use and carry. You just pop your lotion bar out of its container, it is solid and smooth. Turn it around in your hand like a bar of soap and your skin temperature begins to melt the lovely oils. Silky and smooth, not greasy. Smooth it on your legs after shaving, rub it into dry problem areas like your elbows and heels to restore, moisturize and heal. I make mine with essential oils, high quality fragrance oils or leave unscented. It's pure luxury, once you use a solid lotion bar you will never want to be without one. The recipe I like the best can be tweaked any way you like it to make the perfect bar for your skin. Choose your oils and butters according to your preference of their properties. If you are allergic to nuts don't use sweet almond oil, etc. Essential oil, skin safe fragrance oil of choice. I always put a bit of vitamin E in mine. Keep in mind that heavy or greasy oils will make a greasy bar. If you want a harder bar, use more beeswax or more cocoa butter, less sweet almond oil. Just always make sure your recipe adds up to 100%. Lovely, again very interesting. I think a lot of us nowadays are really keen on nourishing our skin not to mention that it is indeed the largest organ of our body. Well done. Cheers! 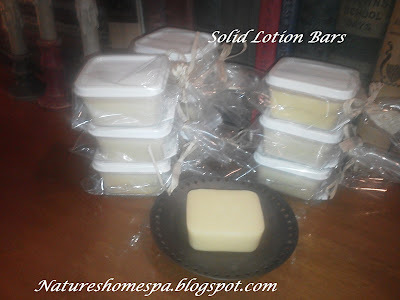 Do you know of any recipe for a solid lotion bar using goats milk? That sounds interesting...might try it. 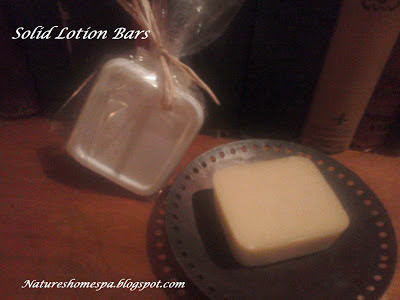 I want to make lotion bars, but really don't want one that leaves my skin feeling greasy/oily. Any suggestions? You said there were some bars that were heavy... does heavy mean solid? Are there oils that skin really likes? Thanks so much! I'm the same as you, I do not like a greasy or oily lotion bar. longer, absorption rate longer, etc. Anna, where did you get your 2 ounce tubs? Hi Karen, I get my 2 oz tubs at our local Dollar Store. You get 10 in a package, in rectangle or round forms. They are superb for the lotion bars. And are BPA free. Hope you can find them! To this amount of oils I add 3/4 tsp of fragrance oil. But this is how I like it to smell! You will need to experiment to see how you like it scented. After all your oils/butters/beeswax are melted together, add a small amount of fragrance oil, stir well. Put a drop of the oil on the back of your hand and rub it in and smell it. Keep a record of how much you use, and when you get it the strength you like. actually can combine fragrance oils and essential oils if you wanted to. Just keeping in mind the dilution rate. For example, I will add a little peppermint essential oil with some of my fragrance oils to brighten them up.